Reports in Spain have it that Manchester United manager, Jose Mourinho is in regular contact with Barcelona's Neymar in a bid to bring the star forward to England. 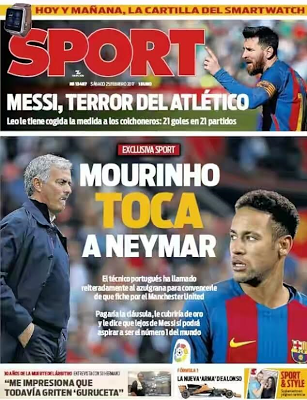 According to Spanish newspaper SPORT, Mourinho has been trying to sell Neymar on the move by explaining how the transfer would benefit the attacker's career and allow him to develop as a player. The newspaper reports that the Man United coach is worried at his team's over reliance on Zlatan Ibrahimovic for goals and wants Neymar to take some of the responsibility off the big Swede's shoulders. Ibrahimovic has 16 in the league this season but the next highest-scorer in United's squad is Juan Mata - with six Premier League strikes. It remains to be seen if Barcelona will let go of one of their biggest assets.